I have finally decided that it is time to catch up with the rest of the modern world and start blogging, to be honest I have decided to go down this route because it is just easier than designing and writing a newsletter from my desktop - yes i am lazy. To start with the blog will just update you on what has been happening in the world of Mahogany but as times goes on it will be far more informative providing you with reviews of the numerous shows that I attend around the world as well as giving my views and commentary on fashion and modelling related issues. It has been a very eventful few months in the world of Mr Mahogany & Mahogany and this is going to be a long blog for sure. Two of our male models Olivier & Alemu modelled for the top menswear designer casely Hayford at London Fashion Week on menswear day. 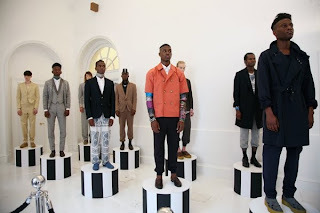 This was great for Mahogany Models as it was the first time that we got male models into LFW. Fashion Diversity returned with 6 workshops, 5 catwalk shows over 3 days and all for free! Mahogany Models Samira, Tanya B, Rosemary & Mimi featured in Fashion Diversity. From the streets of Peckham, Spitalfields and Soho this years Fashion Diversity Honorary Awards were presented to Fashion Houses Gisella Boutique, Junky Styling & Nico Didonna. Established in obscure quarters of London, these designers have undoubtedly carved their mark within very different areas of the relentless and fast paced Fashion industry, and showcased a capsule collection as a snapshot in time of their design journey at this event. 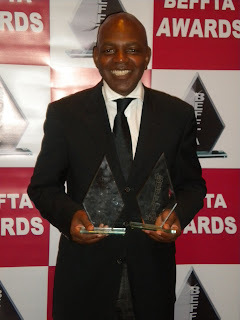 It is with great pride that Mahogany won 3 out the 5 awards we were nominted for at the recently concluded Beffta Awards (BEFFTA stands for Black Entertainment, Film, Fashion, Television & Arts). The awards ceremony took place at the luxurious Hilton Metropole Hotel on Saturday 17th October. Mahogany won awards for Best Modelling Agency (Mahogany Models), Best Events Promoter (Mahogany Productions) & Best Male Model (Ibukun Jegede). Thank you to everyone for there support and for voting for us. I was recently in Nigeria producing a gala evening for the Institute of Chartered Accountants of Nigeria and trust me it was a show and a half with over 2000 people in attendance. Even if I say so myself the show was hot and I had a great Mahogany Productions team supporting me which included Yemi - CEO Mahogany Productions Africa, Ebere - Events Manager, Vicky - Productions Manager, Linda - Backstage Manager & Deola my worn out hard working Production Assistant. 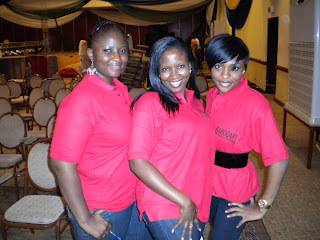 A big thank you to everyone in Abuja, Nigeria that supported us, we are looking forward to our next show. One of the highlights of London Fashion Week was having three of our models feature in the Fashion TV fashion show during London Fashion Week. Not only did our models feature in the show but Mahogany Models will be given credit as providing the models on the TV highlights of the show. I was invited to be the head judge at the Miss Uganda/Miss World competition that took place in Kampala, Uganda. It was a great show but there was a lot of controversy because we choose London based Maria Namira as the winner. the audience and the public in general felt that we should have chosen a Ugandan resident as the winner and not someone that resides in the UK. But you know me I will only choose whom I think is best and as there was a split decision among the judges I literally did have to cast the deciding vote. PS Uganda is definitely a country to go back too. The first ever TMC Holland will be taking place in March 2010 in Amsterdam with auditions taking place in November & January. TMC is going places around the world. The grand finale will be taking place on the 5th December in the Gambia and we will be taking over 40 people from the UK to compete in the finale, courtesy of the President of the Gambia and Fabec's Promotion. Mahogany Models continues to break into mainstream fashion and we are providing models to this 2 day major lifestyle event, that is taking place at earls court and 3 of our models Jakadi, Crystal & Vanessa will be modelling over the two days for Untold & Environmental Justice Foundation at the show. Nana one of our rising stars was the only model selected to feature in the Peace Week event that took place at Trafalgar Square and since joining us she has been one of our most popular models. Six of our best models featured in a top Nigerian Charity Show for a charity of Nigerian Doctors - they included Evita, Nana, Tanya B, Danubia, Laurette &Vicky and they wore clothes for 3 top designers which included Roor & Kosibah Creations. This will be "Creativity in Colour"
THANK YOU FOR TAKING THE TIME TO READ OUR NEWSLETTER - PLEASE SUBSCRIBE TO OUR BLOG AND GET YOUR FRIENDS & FAMILY TO ALSO SUBSCRIBE.